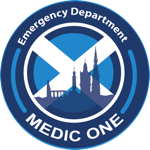 Edinburgh Emergency Medicine - A Sim-Full Year! Consultants Craig Walker, Shirin Brady and Gareth Clegg predominantly led the 2014 sessions and we drafted in Dr Matt Reed and Dr Craig Davidson who enhanced the programme with organ donation/retrieval and Ebola/PPE training, respectively. Deputy Charge Nurse Ian Lee has been seconded to the Scottish Simulation Centre in Forth Valley Royal Hospital and continues his clinical work in the ED meantime. Shirin now has a beautiful new baby and will be back to join us after her maternity leave. We have huge plans for Resus Fridays for 2015! We’re extremely lucky to work in a department in which there is so much enthusiasm and expertise. You’ll see many more ED Consultants leading the training sessions, drawing from their extensive experience and specialist interests, with many more exciting topics being introduced. We have more than a dozen new topics in the pipeline, including Paediatric Resuscitations, Transcutaneous Pacing, Major Incident Management, Procedural Sedation, Surgical Chest Drains and Escharotomies. Our Prehospital Leads will also be getting involved so look out for a wealth of prehospital-based simulations over the coming months. Additionally, there will be more senior nurses joining the Sim Team, including Julia Morris who has taken over in the Nursing Educational Lead role (more details to follow soon). Resus Fridays are only part of the story, though. Many simulation half-day events have taken place in the past year. Themes have included Obstetric Emergencies, Cardiovascular Emergencies, Cardiac Arrests, Major Burns, Team Leadership & Followership and Major Trauma. We’ve performed dozens of rapid sequence intubations, surgical airways, escharotomies, traction splinted, simulated eclamptic patients, major haemorrhages and even blindfolded our team leads (for simulation purposes only!). Initially, these events took place in our departmental Resus Rooms. Hospital building works meant the relocation of Resus and this necessitated that other events took place in the Clinical Skills Centre in the Chancellor’s Building. Our new Resus Rooms will be opening in the next few months and will come complete with in-situ video equipment, allowing us return to the ED, training where we work and helping shape our environment at the same time! We’ve also been developing a new course for EM Higher Specialist Trainees in conjunction with the Scottish Simulation Centre leads in EM and Obstetrics. The “TOPEM” (Training for Obstetric Patients in Emergency Medicine) Course will debut in 2015 and we will publish details about the course in the coming weeks. Throughout 2014, we begged, borrowed, bought and…commandeered (!) as much as we could. We constructed an Airway Trolley to mirror our own departmental one, obtained intubatable mannequins, metal scoops, pelvic binders and even a fully-functioning prehospital transfer trolley, amongst a host of other equipment. We’ve MacGyvered what we didn’t have [“improvised” for those of you too young to remember the TV series…]. We’ve trained in the difficult, the pant-wettingly scary and the downright bizarre. We’re in debt to all those who have helped us along the way; we really couldn’t have done it without you, your time, effort and feedback. A special thank you goes to Dr Janet Skinner and the fantastic Clinical Skills team in RIE for allowing us the use of your facilities, equipment and troubleshooting skills! In summary, 2015 will hold new scenarios, new training sessions, new (and old!) faces, new kit, a new national course, a return to simulation events in our department and new Resus Rooms! It’s been a great year. The next will be even better. Consultant in EM and ICM. Co-Lead, Medic One Sim Team.